chapter 5 : hawaii, 1778-1779. A number of reports of surfring and/or surfboards were recorded by member of James Cook's crew on the expeditions two visits to Hawaii, 1978-1979, however none can be directly attributed to Cook. Although Clerke does not indicate the use of the boards for surfriding, but rather notes their effective use as paddleboards, no doubt they served both purposes. The use of, even a small, board is a significant advantage to paddling speed relative to swimming speed. Furthermore, employed as a floatation device a board can significantly reduce fatigue. Generally, the larger the volume of a board, the greater the improvement in padding speed and distance. Also note that if the board's volume allows the rider to sit above the water line while stationary, there is a marked improvement in their field of vision. A 18th century bone paper cutter was a thin straight blade with bevelled edges and rounded at both ends. In modern parlence, the shape of a wooden ice-confection stick. To summarize Clerke's description: a thin timber board about 24'' wide and with length varying between 6 and 8 feet, the template is essentially parrallel with rounded nose and tail. 5.2 A second report describing boards used for paddling is by William Ellis, Surgeon's Mate, 'Discovery', at Waimea, Kauai, January 1778. In contrast to Clerke, Ellis describes the boards with a a semi-pointed nose, similar to the profile of a shark's head. Ellis's comment on the boards' weight ("very light"), is either based on him personally handling an example or he has noted a similar report by another crew member. The boards may have been built from willi willi (Erythrina sandwicensis) or breadfruit (ulu) (Artocarpus incisus). These timbers will further discussed at length, below. 5.3 George Gilbert, midshipman 'Resolution', also observed Hawaiians paddling boards as an alternative to transportation by canoes. Gilbert's description, while indicating a length at the bottom range of Clerk's account, varies in the narrow width and a tapered template ("sixteen inches in breadth at one end and about 9 at the other"). The board possibly features a rounded nose: "in the form of a blade of an oar". The report of the board's thickness ("four or five inches thick") is significant and not indicated in the other contempoary reports. Subsequent commentators regularly report this feature and it may be implied by Clerke's "exactly in the Shape of one of our bone paper cutters", 2.1 above. The account later implies that members of the crew attempted to paddle the boards, without success. This is consistant with Ellis' comment (above) that indicates the boards have been examined closely by some crew members and must have been held to report the weight. 5.4 Apart from the written accounts, Cook's artist, John Weber in "A View of KaraKakooa, in Owyhee" illustrated a Hawaiian paddling a surfboard for transportation as an alternative to canoes, as described by Clerke, Ellis and Gilbert, noted above. An engraving by W. Byrne, based on an original drawing at Kealakekua Bay, 17 January 1779, was printed in the official account of the voyage, Plate 68. The board and paddler is depicted in the image below, cropped from the much larger work. While it does not indicate any significant details of the board's template (unless the nose template is said to be square), the estimated dimensions closely correspond with Samwell's Kealakekua Bay report of "a thin board about six or seven foot long & about 2 broad" . 5.5 The first report of surfboard riding activity in Hawaii, is by David Samwell, Surgeon's Mate 'Discovery', at Kealakekua Bay, Hawai'i, dated January 22, 1779. This is similar, if a little shorter, to the dimensions as estimated by Clerke, above. 5.6 Another journal entry descibing board riding is from Kealakekua Bay, Hawai'i, March 1779, by Lt. James King of "Resolution" . Following Cook's death on the 14th February 1779, King was promoted to first lieutenant and his duties included continuing Cook's log. This appears to indicate a board approximately 6ft long and 20'' wide with a rounded nose and tail template. The description is consistant with that of Clerke, above. 5.7 Following the return of Cook's third Pacific expedition to England on the 4th October 1780, the Admiralty selected the Reverend John Douglas to edit the logs and journals to prepare them for publication. Despite the similarity in the two surfboard descriptions, there are significant differences between the two accounts of surfriding activity attributed to James King. 5.8 It should be noted that these reports provide a limitted perspective of Hawaiian surfing at the time. Although the reports only indicate prone surfriding, undoubtedly native skills far surpased this activity and there was a greater range of board designs than those observed. In total, the ships of Cook's third pacific expedition were anchored in Hawaiian waters for 49 days. It would appear that the most observations were probably at, or around, Kealakekua Bay. the North Pacific, and the extended anchorages were all on the southern coasts. Clerke's decision to relocate to Waimea Bay on Kaui was sensible. For a dramatic account of Polynesian sufriding on a coast explosed to seasonal swells, see James Morrison's account on Tahiti in 1788, 3.8. 5.9 It is important to note that all hand shaped surfboards are unique and any general reports of a board's characteristics as these would not indicate specific individual features. Also note that craftsmen working in timber are likely to be guided to some extent by the specific chracteristics of a particular tree or piece of timber, for example splits, knots or woodrot, that may determine a board's dimensions. Finally, board design may fluctuate with local conditions and/or local precedents. 5.10 The reports by Cook's crew are summarized in the following tables. * Estimated from Webber's illustration. ** "nearly in the form of a blade of an oar" . *** "exactly in the Shape of one of our bone paper cutters"
* King as edited by Douglas, 1784. 5.11 The accounts of Hawaiian surfboards detail four cases of their use for transportation (Clerke, Ellis, Gilbert and Weber) and three cases of prone surfriding (Samwell, King and King as edited by Douglas). Undoubtedly, the boards observed as 'paddleboards', were also used, if not intended, for surfriding. In all cases, the reports refer to adult (on one occassion, tandem) paddlers or riders and those that indicate an empirical length, record a consistent six foot or longer, one indicating a maximum of eight feet. Three reports indicate a width of about 24 inches, one at 20 inches. Since maximum board width is essentially determined by the width of the paddler's shoulders, these boards probably fell in the range of 20 to 24 inches. Two reports indicate the board is ''thin'' , one as ''flat'' and one notes the lightweight of the timber. The latter feature may indicate the use of willi willi, see below. The nose is reported in four accounts as "round", and the tail as "round" in three accounts. 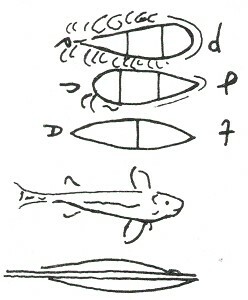 Samwell's distinct description of the nose profile as "the similitude the anterior part bore to the head of that fish (a shark)", resembles some early examples held by the Bishop Museum. Ellis implies the nose and tail have identical profiles, but in the other cases both ends may be "rounded" but with differrent profiles. 5.12 Gilbert's account contrasts substantially to the other reports yet, as the most detailed, it cannot be discounted. While the length conforms to other accounts, the width measurements may be in dispute. It is difficult to know whether the 16 inch width ("sixteen inches in breadth at one end") indicates a measurement at the nose, and the maximum board is somewhat wider, or 16 inches is the maximum board width. Certainly the dimensions ("and about 9 at the other") indicate a foiled template which is not recorded by the other observers. Gilbert's dimensions certainly indicate the board in cross-section is convex, at least on one side if not both. cutters" (my emphasis), but is not indicated in the other reports. The noteable difference is the thickness. Gibert's specific report "four or five inches thick, in the middle, tapering down to an inch at the sides" , contrasts markedly with (the more the general term) "thin", as used by Clerke (2.1) and Samwell (2.5). The difference is significant and it is hard not to conclude from the sum of the reports that there are two distinct designs identified. One design is wide and thin, the other a narrower and thicker board. The rationale for two distinct designs may be the result of a number, or a combination, of factors. In this case it might have been difficult to source trees of desirable width, and the volume was adjusted by shaping a thicker board. Alternatively, if the source timber was a lighter and structually weaker variety than the common koa (that is willi willi or breadfruit), such a thickness may have been considered necessary to retain strength. Furthermore, a lighter or structually weaker timber may be more susceptible to impregnation by seawater and a thicker board may have reduced the possibility of wood rot. The narrower and thicker design may have been deemed more suitable to specific wave riding conditions. A narrower board may be more suitable for riding in a prone position, but it is speculation if the thickness was preferred for waves with a gentle or a steep sloping face. Note that later commentators (20) have determined thickness (in excess of three inches) as a distinct feature of the olo board, the largest known design that reportedly extended to 18 feet in length. 1. The rank and vessel allocation of Cook's crew are based on their postions up to Cook's death in 1779. Following Cook's death, Charles Clerke assumed command of the Resolution and the expedition, with adjustments in the chain of command requiring some transfers between the two ships. Beaglehole, J.C.: The Life of James Cook. Stanford University Press Stanford, California. 1974, page 675. A further re-allocation of duties followed the death of Clerke in the Nothern Pacific in August 1879. Beaglehole: Cook (1974), pages 682-683. 2. The (unaccredited) quotation was contributed in a personal email by Patrick Moser, Drury University, July 2006. 3. Conversation with Scott Carlin, Curator, Vaucluse House, Sydney, March 2006. 4. Ellis, William : An Authentic Narrative of a Voyage Performed by Captain Cook and Captain Clerke, in his Majesty's Ships Resolution and Discovery, During the Years 1776, 1777, 1778, 1779 and 1780; In Search of a North-West Passage Between the Continents of Asia and America. The quotation was contributed in a personal email by Patrick Moser, Drury University, July 2006. Produced in Hanapepe, Kaui, Hawaii. 2004 (ed, 2004), page 15. Note, however, the quotation omits the final phrase "to an inch at the sides." The full quotation was contributed in a personal email by Patrick Moser, Drury University, July 2006. Sincere thanks to Patrick Moser for his substantial contributions to this subject. Holmes, Christine(editor): Captain Cook's Final Voyage: The Journal of Midshipman George Gilbert. University of Hawaii Press. 1982. Page? 6. Surfboard rails, the left and right edges of the board’s template, blend together the deck and bottom shapes. Rail shape is basically determined by the board thickness at any given point and in many examples the rail profile subtlely varies through a range of shapes longitudinally from the nose to the tail. They are the most difficult feature of surfboard design to describe and/or measure. Most common on hollow timber boards, c 1935-1955. Round. from deck to bottom. Chine*. meet at a distinct edge. * The double chine rail is a common feature on modern body boards, generically termed Boogie boards. Rail profiles also vary in elevation, relative to the centre of the board's profile between the deck and bottom. 7. There are three basic template shapes, essentially determined by the location of the widest point. Adjustment of the wide point varies the ratio of nose area to tail area. 1. The two external curves that proscribe the outer dimensions of a board when viewed in plan, either the deck or the bottom. Most obvious in the Double Ender, but the nose and tail templates do not have to be, and often are not, similar. Also commonly called a Gun template, the template was classically associated with high speed on large waves. The template was classically associated with high manoureability on small waves. The name first used commercially by Dale Velsey, circa 1956. These three basic designs were possibly first identified has having different hydrodynamic proprties by Leonardo da Vinci, circa 1515.
based on Institut de France, Paris, 1510-1515. 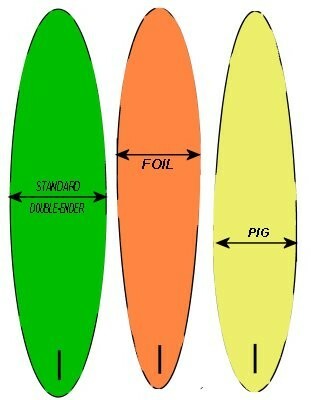 From the top: Foil, Pig and Double-Ender. The additional markings on the Foil (top) represent the water vortexes created by the drag of the hull. 8. Gilbert in Dela Vega et. al: Surf Literature (2004), page 15. 9. Cook, James and King, James: A Voyage to the Pacific Ocean Undertaken by Command of his Majesty For Making Discoveries in The Northern Hemisphere Performed Under Captains Cooke, Clerke, Gore in Years 1776, 1777, 1778, and 1780, being a copious and Satisfactorary Abridgement. G. Nicholl and T. Cadell, London, 1784. Plate 68. The image may also apear in subsequent editions, see publishing details below, point 10. Rutland, Vermont and Tokyo, Japan.1966. Plate 1, between pages 14 and 15. Dee Why West, NSW 2099. 1970. pages 20 - 21. Palm Beach NSW 2108. 1983. page 33. 1 West 39 Street New York, NY 10018. 1984. pages 44 - 45 and 47. Los Angles. 1997. Second edition 1998. page 32. P.O. Box 6099 Rohnert Park, CA 94927,1996, Appendix B, page 12. Dela Vega et. al: Surf Literature (2004), page 15. Aughton, Peter : The Fatal Voyage - Captain Cook's Last Journey. Referenced as "Samwell page 1164". 11. Beaglehole: Voyages(1967) Volume 1, 1967, page 268. Finney and Houston: Surfing (1996) Appendix B. Page 97. "The British Admiralty published an edited account of Cook’s voyages in three quarto volumes and a large atlas in 1784-1785, now generally known as 'A Voyage to the Pacific Ocean'. For almost 200 years Douglas’ version of Cook’s writings was erroneously accepted as Cook’s own. Cook’s journal, with its bloody ending supplied by James King, proved popular. It reveals that Cook was a somewhat dull reporter, more interested in geography than anthropology." 13. Cook and King: Voyage (1784) pages 145 to 147. A second edition compiled by another editor followed. Cook, James and King, James: A New, Authentic and Complete Collection of Voyages Round the World, Undertaken and Performed by Royal Authority. Containing an Authentic, Entertaining, Full, and Complete History of Capt. Cook's First, Second, Third and Last Voyages. Neueste Reisebeschreibungen; oder, Jakob Cook's dritte und letzte Reise . . . in den Jahren 1776 bis 1780. Finney and Houston: Surfing (1996) Chapter 3. pages 36-37. 14. Finney and Houston: Surfing (1996) Footnote, Page 32. 15. Robson, John: Captain Cook's World - Maps of the life and Voyages of James Cook R. N.
maps 3.12, 3.23, 3.24 and 3.25.
context to Cook's voyages that is simply not possible from written accounts. 16. Finney and Houston: Surfing (1996) pages 28 to31. Eight ancient surfing locations are identified at Waikiki and Honolulu on Oahu (page 30), seven at Hilo, Hawai'i (page 28). 17. "Winter (November-February) swells are born from fierce storms in the north and west Pacific. These powerful swells generate strong surf along the NORTH, WEST, and EASTERN shorelines. During summer months (May-August), waves are generated from storms located in the south Pacific where winter is in full force. These warm, blue swells will cause surf along any shoreline with a southerly exposure." P.O. Box 64 Redondo Beach, California 90277. 1971 Page 9. 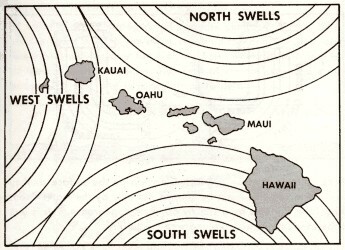 "Common swell directions, Hawaiian Islands." P.O. Box 64 Redondo Beach, California 90277. 18. Noted surf movie producer, Bruce Brown used the, now classic, surfing comment "You really missed it, you should have been here yesterday!" throughout his ground breaking surfing film The Endless Summer (1966), but on one occassion (speaking for Rodney Sumpter at Bells Beach, Australia) the line was adjusted to "You really missed it, you should have been here six months ago!" . Californian surfer Phil Edwards featured in Brown's films and incorporated a version of the line into the title of his 1967 book. 19. Circa 1878, extremely thin boards were noted by John Dean Caton, who estimated a thickness of "about three quarters of an inch thick." 20. The earliest account that identifies the two distinct surfboard designs (one "broad and flat", the other "narrower") is by the native Hawaiian historian David Malo, circa 1838. Malo, David: Hawaiian Antiquities (Moolelo Hawaii). Originally composed between 1835 and 1838. Second Edition: Special Publication 2, 1951. Reprinted 1971, 1976, 1980, 1991, 1992, 1997, 2005, page 223. "The 'olo' is thick in the middle and grows thinner toward the edges." "The 'alaia' board, ... , is thin and wide in front." I'i, John Papa: Fragments of Hawaiian History. Second revised edition 1993. Sixth printing 1995, page 135. Note that I'i also identifies a third design ("The 'kiko'o' reaches a length of 12 to 18 feet") although its status is questionable and it may be a long vesion of the olo. For an expanded discusion of John I'i's account, see 7.6 below.